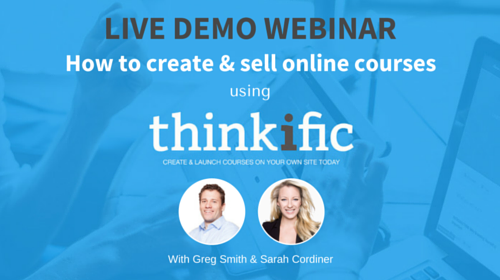 In this webinar (recorded on 19th July 2016), Greg Smith, CEO of Thinkific creates an online course LIVE whilst walking and talking you through all of the major features and functions of Thinkific. Whether you are new to online course creation, or have been doing it for a while, this demo will show just what is possible and how easy it is to run an online business without any technical skills! Valuable info well delivered and a good intro to Sarah and Thinkific. CEO of Thinkific AND Sarah!